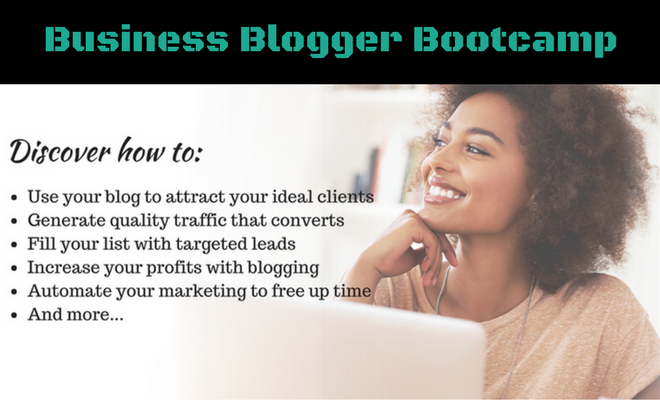 Finally, Easy to Follow Steps to Creating a Blog That Will Get You More Clients & Increase Your Income…Even If You Don’t Know the FIRST Thing About Blogging! Over the course of 12 weeks, you will be guided through the most effective and profitable ways for entrepreneurs, network marketers, small business owners and service based professionals, to create and market a traffic generating, income producing blog for business. You will be taken by the hand through every step you need to start establishing a credible brand, producing content that attracts quality prospects and start earning a steady, and increasing, stream of income. From getting crystal clear on your niche market to designing a system on autopilot – you will develop the skills to recognize the needs of your market and how to deliver compelling content that converts. Each week you will receive a downloadable audio lesson & PDF that builds on the last and includes specific examples to clarify the lessons. You will also get Worksheets to help you through the lessons with actionable steps you can begin to apply right away! *PLUS…you will also receive exclusive access to my private, members only Facebook Group classroom, where you can interact with me and other like-minded entrepreneurs.